Autumn in Japan has come a bit late in 2018, but that doesn’t take away from the fact that it’s still the most gorgeous time of year (sorry sakura fans). ‘Tis the season for perfect crisp weather, vibrant colors and gastronomic delights like chestnut and pumpkin as well as slightly less delightful mystery fruits and edible insects. 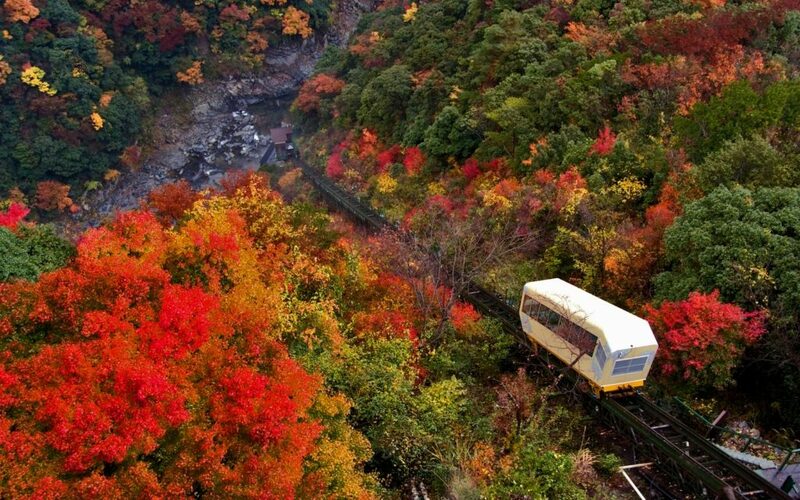 Whether you choose to hike or bike on mountain trails, ride a ropeway up a mountain or take a scenic train route, there’s no shortage of spots across Japan to view the colorful displays of fall. 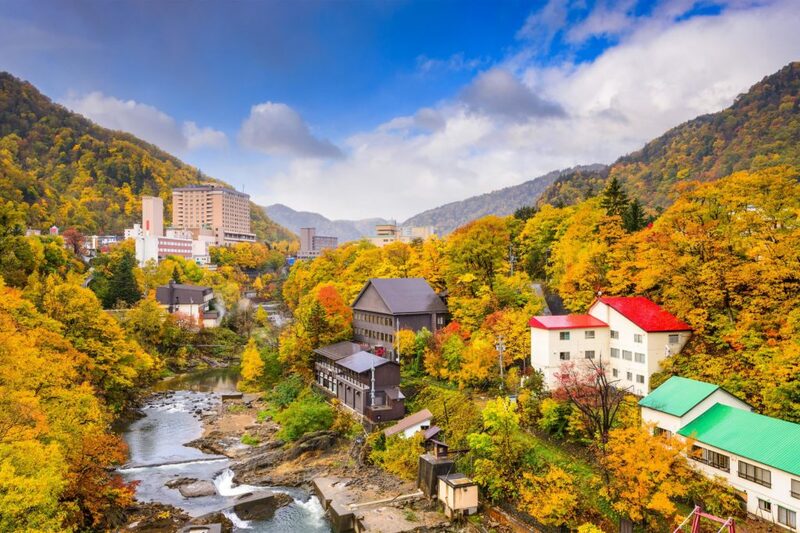 Top it all off in one relaxing weekend getaway to maximize your fall experience by soaking in an onsen (hot spring) while taking in the sights of auburn, gold, brown and orange leaves — the autumn colors known as koyo in Japanese. The act of deeply appreciating the autumn colors is culturally referred to as the “koyo season,” which typically begins in in late-September to October in the north and creates a magnificent color gradient gently spreading to the rest of the country through November or early December. For an onsen-and-fall-colors combo, we bring you 10 locations that will broaden your Japan horizons and offer the perfect weekend getaway across Japan — from northernmost Hokkaido all the way south to the remote island region of Shikoku. This hot spring town is just an hour’s drive from Sapporo and statues of kappa, a Japanese water sprite, decorate Jozankei. Take a ride on the Kouyou Kappa Bus, a tour that offers a 60-minute scenic ride of the best spots to take in Jozankei’s fall foliage. The tour also includes a stop at the exhibition room of the Ainu Culture Promotion Center. Discover more about the seasonal specialties in the area: Jozankei Onsen. In operation since the Edo period, Kuroyu Onsen is one of seven hot springs located in Nyuto Onsen Village, an area within the sprawling Towada Hachimantai National Park. At Kuroyu Onsen, you can try out konyoku rotemburo, mixed gender open-air bathing, in addition to its indoor baths. All baths on-site offer an incredible view of untouched nature and are especially beautiful in October/November when the leaves change color. For perfect hiking spots nearby, see more on Kuroyu Onsen. 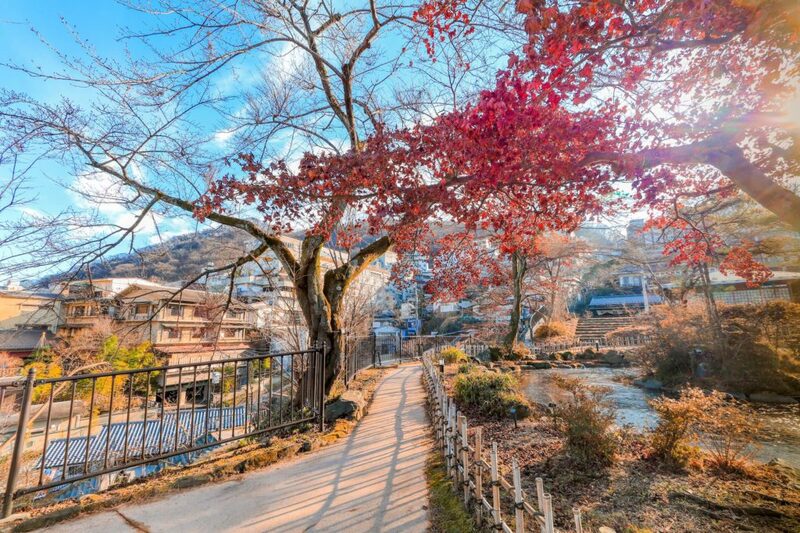 If you’re simply looking to get away from it all, consider a weekend in Naruko Onsen village. 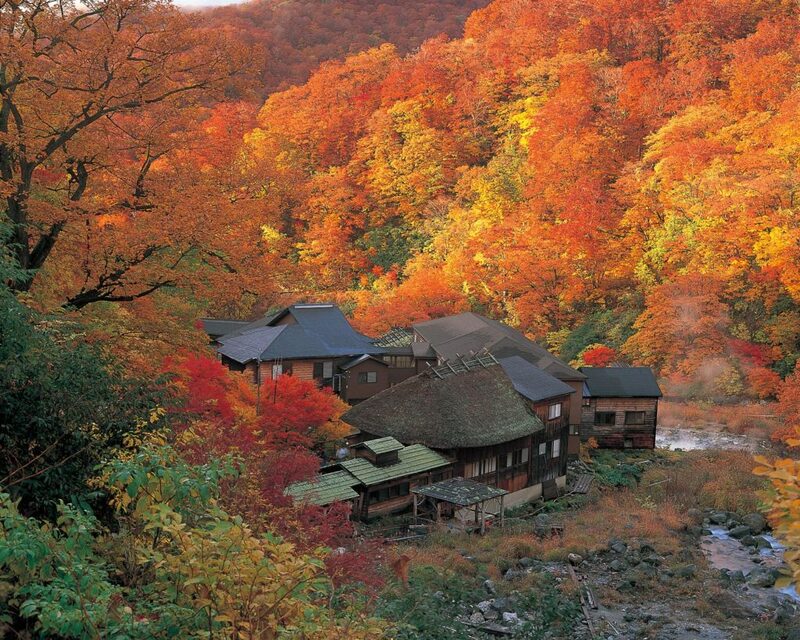 Situated near Sendai, its onsen and nature trails come alive in autumn. 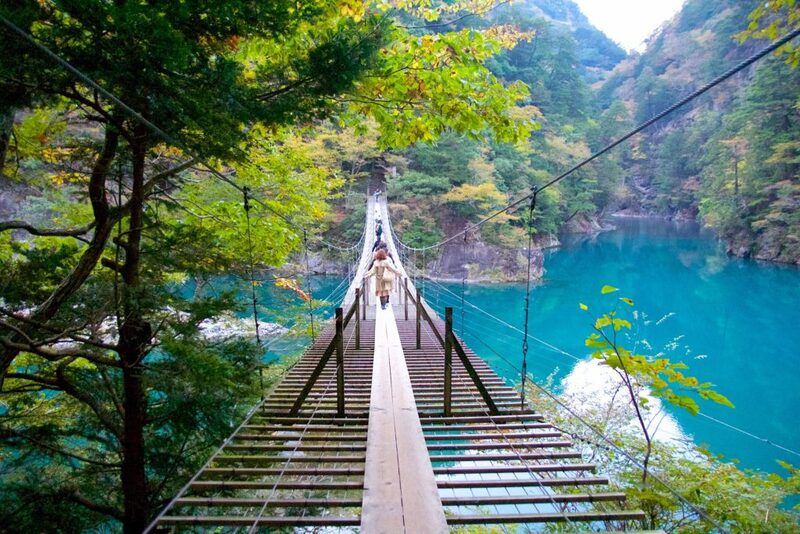 Visit Naruko Gorge or the Hosomichi trail for unspoiled views of the colorful leaves that autumn has to offer. If it’s onsen you’re after, the village is ideal. With nearly 400 different mineral-rich water sources, you could spend a lifetime trying them all! For more on what to do in the area: Naruko Onsen. Tucked away in the mountains of Gunma is Ikaho, an onsen town with a more than 400-year-old tradition. It offers fun fruit picking in addition to fall activities like hiking, camping and fishing. Check out the view of fall foliage at Ikaho Shrine, located at the top of the Ikaho’s famed stone stairway of 365 steps. You can also take a ride on the Ikaho ropeway for a view of fall colors from the mountain top or stroll across the scenic Kajika Bridge, as well. For more about the area: Ikaho. The home of the elaborately decorated Toshogu “Three Wise Monkeys” Shrine, Nikko is also a showcase of some of the more popular displays of fall foliage in Japan. The Oku Nikko region of Lake Chuzenji and Yumoto Onsen attracts large crowds — especially during weekends of peak fall foliage. With convenient access from Tobu Asakusa station, Nikko makes an attractive day trip for those in Tokyo seeking to truly experience fall in Japan. 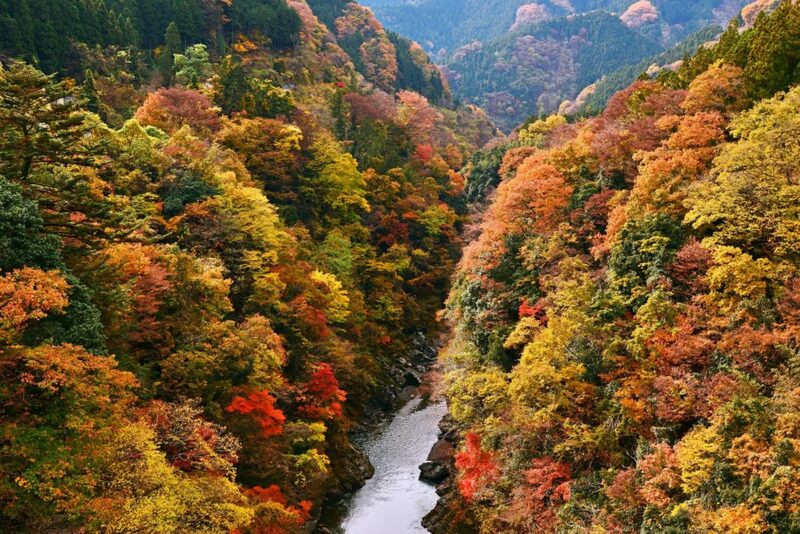 More on this vibrant autumn spot: Nikko. Consider a day trip to Chichibu, Saitama’s largest town, for an onsen experience to help you unwind from the hustle and bustle of urban life. 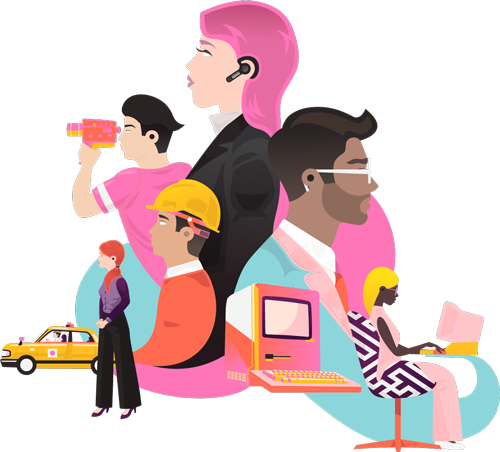 Plus, its proximity to Tokyo doesn’t hurt for decent accessibility. Once you’ve regained your strength, take a hike up Mt. Hodo and stop by Hodosan Shrine at the summit. Descend the mountain via the Mt. Hodo ropeway while taking in the sights of autumn. A hotspot for nature, see more on this dreamy outdoorsy getaway: Chichibu. 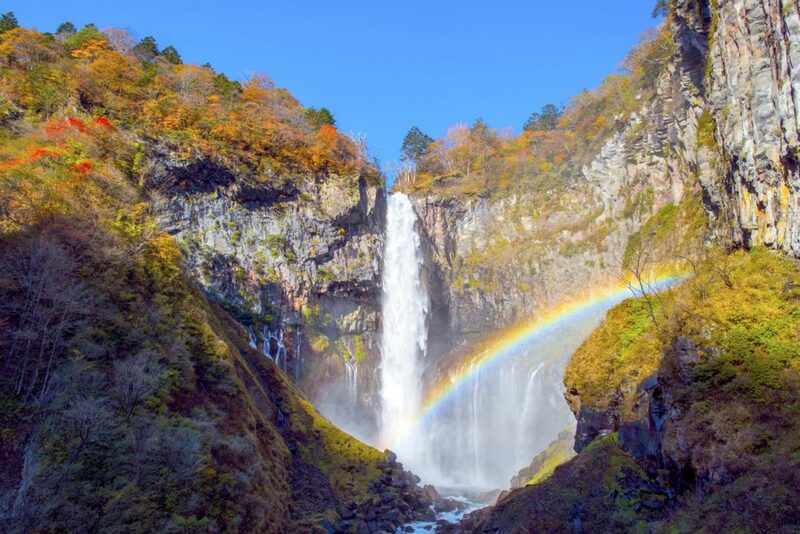 This pair of waterfalls — with cultural, historical and religious significance — is located within Fuji-Hakone-Izu National Park and within easy reach of the southwestern hills of Mount Fuji. 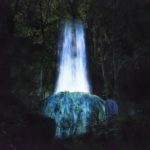 Shiraito Falls is a 20 meter high, 150 meter wide cascade of long, white threads that resemble silk while Otodome Falls is a 25 meter high forceful rush of water. In autumn, you can see a snow-capped Mount Fuji peering over plumes of colorful leaves. Learn about what onsen are in the area: Shiraito and Otodome Falls. Colors are just turning, but later in the season it's absolutely gorgeous. Sumatakyo Gorge is a great place to enjoy the spoils of nature in autumn. Thrill seekers will love crossing Sumata River on the rickety — but ultimately safe — suspension bridge that has a width of only 45 centimeters! If you prefer more leisurely activities, the gorge is peppered with walking trails. Don’t skip out on the onsen — the waters boast properties that claim to make skin silky, smooth and beautiful. More on what to do when you visit this blue wonder: Sumatakyo Gorge. 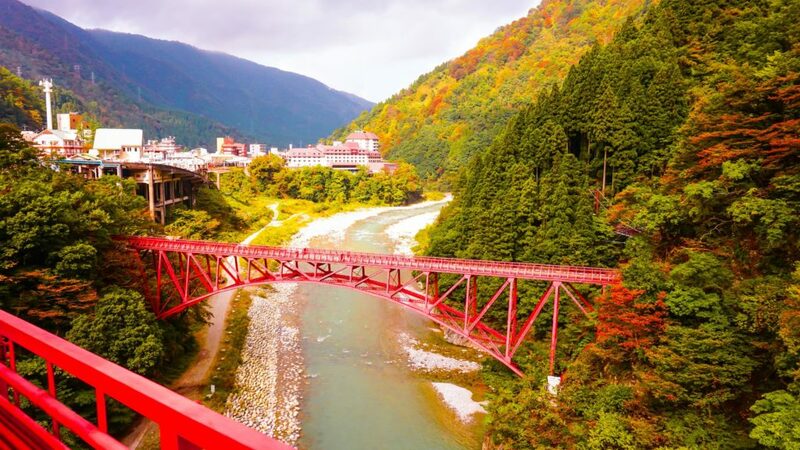 Kurobe Gorge, one of Japan’s deepest valleys, cuts through the country’s “Northern Alps” mountain range and is where you can really experience some of autumn’s natural scenery and serenity. Whether you choose to travel by the Kurobe Gorge Railway, a sightseeing train, or to soak in healing hot spring waters, there’s no shortage of colorful delights here. Among famed hot springs in the area are Unazuki, the mixed rotemburo (open-air bath) of Kuronagi and the foot baths at Kanetsuki. 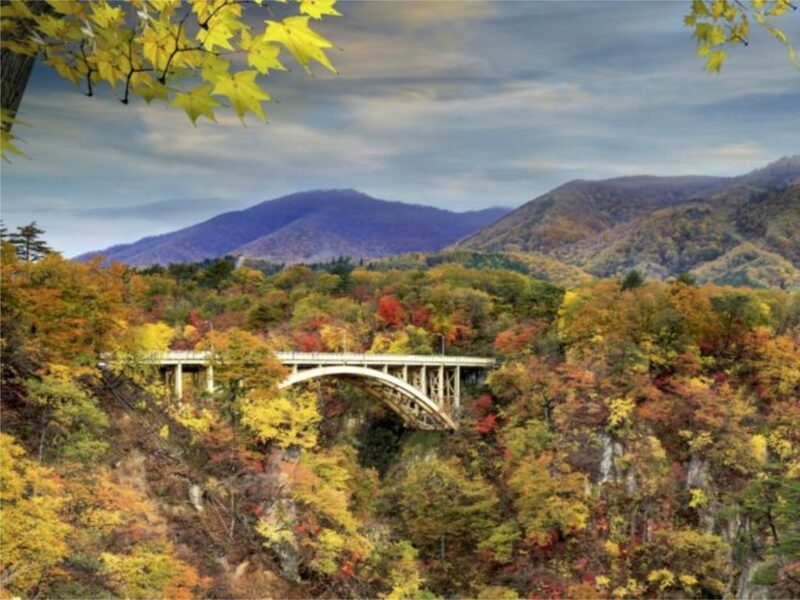 For absolutely stunning fall colors and more: Kurobe Gorge. Late October is when the trees of Iya Valley blaze a fiery red and orange. If you’re looking for a unique way to experience Japan in autumn, you’ve come to the right place. 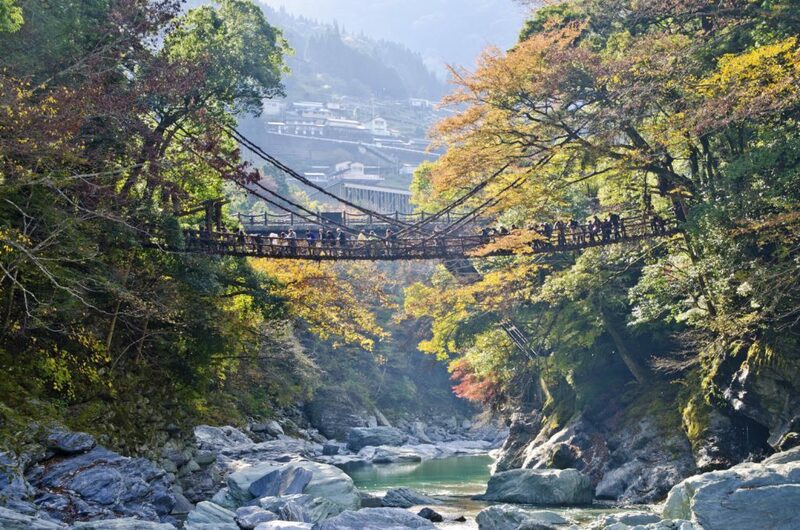 Cross Iya Kazura Bashi, a two-meter-wide vine bridge that rises 14 meters above the Iya River, or take a scenic cable car ride to the open air baths of Hotel Iya Onsen and be rewarded handsomely with the sights of fall as you’ve never seen them before. For more on this wild retreat: Iya Valley. 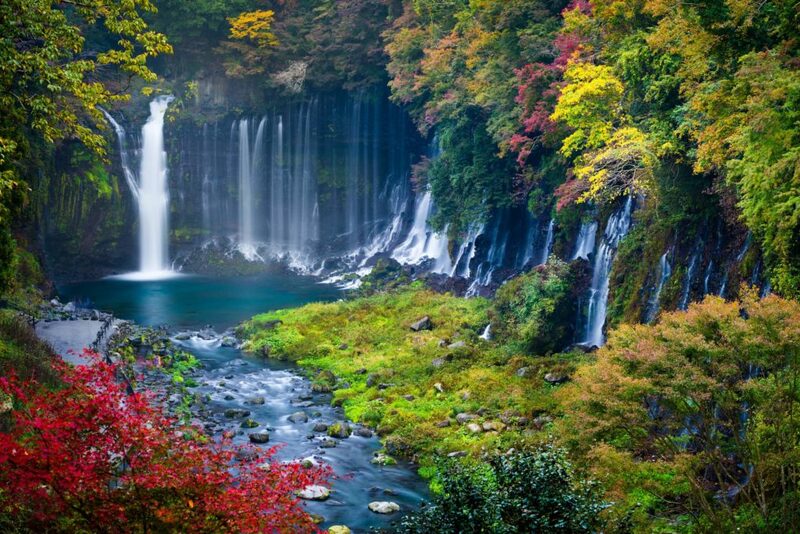 Fall in Japan is an undeniably beautiful season that is complemented by the country’s vast reserves of nature. These 10 spots for fall foliage and onsen relaxation are just a taste of the thousands of famed locations and hidden spots across Japan waiting to be discovered. Find more autumn spots in Japan on our travel site. If you are looking to do onsen with tattoos, please check out 30 tattoo-friendly onsen in Japan. Do you have a favorite spot for fall colors in Japan? Let us know in the comments below. 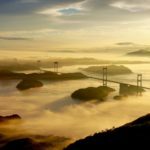 From avant-garde theater to EDM fests to ancient spectacle, there’s something for everyone across the archipelago. It’s autumn — the best time to eat insects! Join GaijinPot as we take a gastronomical tour of bugs in the traditional cuisine of Gifu and Nagano prefectures.